Whether you order wood or metal horizontal blinds online or purchase them from a home improvement store, you'll need to know the exact measurements to ensure the best fit to the window. Besides measuring for the width and height of the window, determine what slat size the horizontal blinds should have. Generally ranging from 1/2-inch wide blind slats up to 2 1/2 inches wide, the slat size will affect such aspects as the finished look of the window, the amount of light allowed through and the type of view you'll have. Measure the size of your window and determine the height and width. Choose blinds with slats that match well with the proportions of the window. Pick blinds with smaller slats for small to medium windows, such as 1/2- to 1-inch wide slats, so the blinds do not overwhelm the space. Choose 2- to 2 1/2-inch wide slats for big windows, because smaller slats on large windows can look mismatched and cluttered. Measure the window depth, especially if you are doing an inside mount where the blind hardware will be installed inside the window frame. Match the window depth with an acceptable slat size; don't choose 2-inch slats for a 1-inch deep window, for example. Decide the amount of light you want to let into the room when the blinds are closed. Smaller slat width allows more light into the room because there is more space between slats where light seeps through. Choose larger slats, such as 2 inches or above, if you want a darker room, because fewer slats equals fewer openings between them. For example, if your window faces north or east, choose a smaller slat width that lets in the most light to brighten traditionally darker rooms. Figure out how restricted your view of the outside should be. Note that smaller slats, from 1/2 to 1 inch, will require nearly twice the number of slats to cover the window as those blind styles with 2 inches or larger slats. More slats means a more obstructed view. For the least obstructed view, choose large 2 1/2-inch blind slats. Figure the cost of the different styles of blinds into your budget. 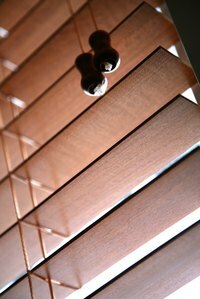 Note that horizontal blinds with a larger slat width generally cost more than those blinds with a smaller slat width. If cost is an issue, choose the slat size that best meets your needs and still fits within your budget.